Recently the Ingoma Foundation and theCONNECT attended the Aspen Institute’s Opportunity Youth Incentive Fund (OYIF) grantees convening in Chicago. We were one of 24 sites present, while there we visited sites in Chicago that are doing great work with youth. We attended many panel discussions, and workshops, that were led by business leaders like CVS, and well as Chicago based youth groups like Chicago Youth Authors. Below is reflections from Nehemiah Hall-Youth Support Specialist for the Ingoma Foundation and Paulo Gregory Harris-Executive Director of the Ingoma Foundation. Chicago and Baltimore share challenges both with engaging youth who are disconnected from viable pathways to prosperity, and the pain of urban communities with significant portions of their populations falling into economic deserts. As we listened to the OYIF 2016 April Convening opening plenary “Perspectives on Chicago from System & Local Leaders”, we couldn’t help but reflect on how the lessons lifted up by the panelists translated to our community and work in Baltimore. It was poignant as Melody Barnes acknowledged the young lives lost in Chicago at the start of the plenary. It was also noteworthy that Michael Strautmanis from the Obama Foundation stated that it is rare to see young people at the table where the decisions impacting their lives are made. These realities are not disconnected, and are reflective of patterns we see in Baltimore and around the country, that not only exclude young people from the table, but exclude the community, and individuals of color, from even the most fundamental decisions that profoundly impact us. What naturally flows then is that this pattern is mirrored in access to the substantial resources that create the capacity to do the work at scale, and to influence what is measured, prioritized and fiscally recognized as having an impact. As youth and communities struggling for survival, no one knows more about our experience than us. What we as youth need is the emotional outlet to breathe beyond our pain, and the support, built on an understanding of who we are, that meets us in real and tangible ways to help us create our own pathways to sustainable futures. How do we measure what really works without being at, or even more, owning, the table? For example, when I first started work with the Ingoma Foundation, I wasn’t getting paid for anything. The only reason I came was because someone I love and trust aimed me to the opportunity. Another young man, Huey, was looking for a job. He came in and we asked, “What makes your soul sing?” Huey later told us, “When I heard that, I knew this place was different because no one ever cared to ask me that before.” There was an outlet here, and direct relationships that I couldn’t find elsewhere. There were groups of young people my age – some just like me, some not like me, who worked together to create a program designed by us, for us. Those kinds of supports don’t get funded unless you have some magical data person and the resources to translate those intangible elements into “evidence-based practices”. That part of the story is difficult to quantify, yet it is the most important ingredient in the transformation of a life. In Baltimore we see scaled and well-funded programs having trouble attracting young people. We have been in dialogue with funders and other system players to raise the level of consciousness of these issues, and are starting to see change. This week is the anniversary of the Baltimore Youth Uprising that took place on April 27, 2015. It took this level of youth expression to open the eyes of those who hold the major purse strings to look at resources aimed at youth differently – but the distance between youth, community and the resource flow is still a chasm. As an Ethiopian proverb warns, “If the youth are not initiated into the tribe they will burn down the village just to feel its warmth.” We on the ground in Baltimore have known this, and since the uprising, we are now seeing innovations by our system colleagues. The Mayor’s Office of Employment Development, in partnership with the Annie E. Casey Foundation, have recently released an RFP that insists that community partners not only be at the table but, even more, must be compensated for their work within the project. They know that it is the relationships that exist in the community that are the real pull for young people, and those relationships are a commodity that needs to be funded. You have to have a balance between looking at people as objects and numbers – and the human element that actually pulls in, and leverages the growth in youth. If we shift to a system that is more responsive to youth, and one that youth lead and are part of the quality control, we will begin to find new ways of measuring, and creating real impact. Just as the Chicago Cook Workforce Partnership held local programs to performance standards that had teeth and raised the bar for the overall system, equal or greater standards need to be upheld for the other side of the impact spectrum. As Julius Robinson from Becoming a Man (BAM) shared, “I had a safe haven to go to, to talk about my feelings about what I was going through in my life.” One clear and powerful measure will be the lives saved as youth are wrapped in the love and support of the entire village. This summer has been a busy one for the Ingoma Foundation; besides our current Youth Unlocked Summer Session and our current #OutoftheBox Tour. We have added something new. We have decided to engage our community by having workshops that get people moving, laughing, being, and getting to know each other outside of formal meetings. Giving people the opportunity to let their hair down and have fun. We’ve partnered with neighboring community organizations, OC250 and North Barclay Green Community Center, to launch Monday Funday. 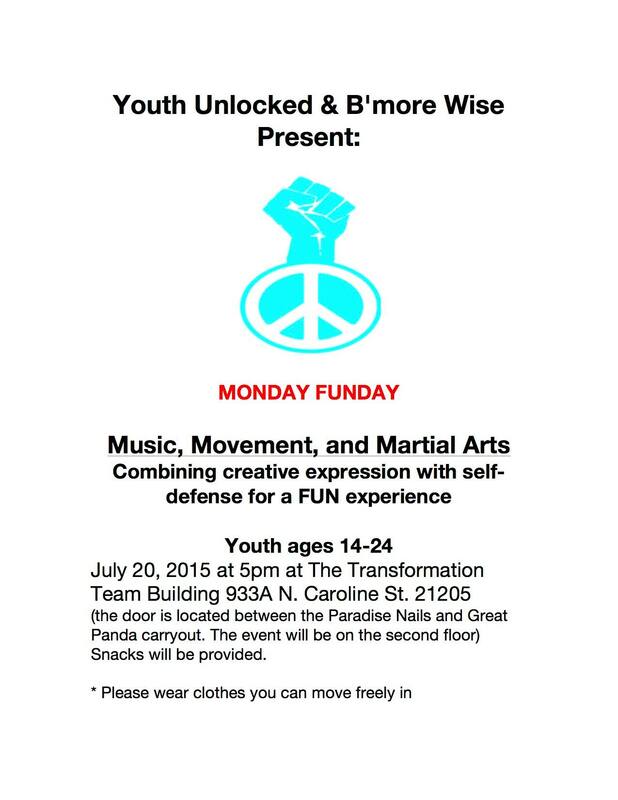 Last week we kicked off our Monday Funday series, we partnered with our neighbor Paradise Nail Shop and did facials, manicures and pedicures.Today we’ll be parting with the Baltimore Wisdom Project for our Music, Movement and Martial Arts workshop.